Mobile Home Shed Plans for your Backyard. Do you need to get mobile home shed plans. You have your brand new mobile home installed on your beautiful two acre lot. It Looks great and you are the envy of your new neighborhood. Your furniture is laid out in its correct place, everything is neatly stowed away in the gourmet kitchen. The closets are full of clothes and shoes, the family photographs and keepsakes are stacked up neatly on the top shelf. There is a lawnmower on the front porch, the kids bicycles are in the hallway and there’s an extensive collection of do it yourself power tools stored under your bed in the master bedroom. Your partner is anxious to know how long your “junk” is going to be littering the spaces in your new house. Apparently they didn’t get the memo and are not quite so attached as you to your prized possessions. So you need a safe outdoor storage solution for your equipment and tools. So assuming that you don’t want to sell the offending items which you have lovingly shipped from home to home for the past 10 years, what are you going to do? You need a way to store these things on your new property without them cluttering up your new house. The storage needs to be safe from intruders and protected from the rain and extremes of weather. So these are your main choices: Home extension or a shed. Buying and installing a premade backyard Shed. Work out how much room you need to have and decide if you will buy the shed or if you have the necessary skills to build it yourself. If you are going to buy a shed for your backyard make sure that the seller has engineered drawings to support its installation. Most shed manufacturers do supply this information. The shed installer should also make sure that your shed is tied down and anchored to the ground according to the local building code requirements. Are you allowed to Build a Shed on Your Lot? This can be a sticking point with many home owners. Many people assume that they can put a shed on their land and that it is nobody else’s business what they do with their own backyard. To some extent I agree with that sentiment. Unfortunately those days are long gone especially in California and Florida. Before you go any further it’s a good idea to make inquiries at your local building department to ascertain their requirements for your shed. Take the time to talk to the building department before you start a project they can take a very dim view of structures installed without the necessary permits. Please take the necessary precautions to prevent fines and other action by your local code compliance department. Many people think that is OK to just buy a shed from Home Depot and place it in your backyard, it may well be but it pays to check first. Most local authorities will require at the very least a site plan and a copy of the engineering plans for the structure. Do You Need Engineered Plans for your Backyard Building? If you’re buying your storage shed plans can usually be obtained from your supplier. If you are going to do your own construction you will need to buy a standard set of building plans. These have usually been stamped by an engineer in your state. 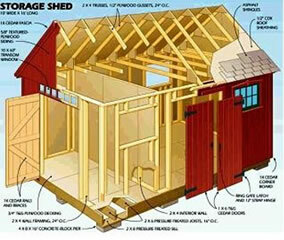 DIY shed plans, Do It Yourself. Building your own shed is within the capabilities of most homeowner with the neccessary tools and some help from friends. Power tools such as framing nailers and miter saws are readily available. There is plenty of help online with comprehensive tutorials on Youtube to help you through the process. If you decide that you are going to build your own shed it will be much easier if your construction concept follows a detailed and complete set of plans. These building plans and instructions usually include a number of floor plans that should meet your specific specifications. Usually these plans include some form of online help and assistance.